Workspace is fun as well as functional. Hot Corners launches them with just a cursor swipe (or finger) in the corner. I use workspace to store programs which otherwise would take time/effort to launch. Like the Software Manager for example. You can lay it out any way you want but remember, if you restart it is gone. You can drag programs from one Workspace to another. Cant drag the VLC player though. With just a little use you may enjoy Workspace. Here is my current collection of useful workspaces. 7. Virtualization movie playing. Looks great on a big screen. It is a little hard to view this as it is dimmed in this menu mode. Last edited by Ozo on Sun Mar 25, 2018 4:19 pm, edited 1 time in total. Oh yes, I love my workspaces. I have four of them and each has its designated purpose. Workspaces are awesome! They're one of the things I miss most when I have to use Windows. Normally I have 3-4. I don't name 'em like @Moem though. MATE doesn't support it, and if it did I probably still wouldn't. (b) dragging from one pane in the workspace applet to another pane. On Cinnamon, I had to go to what I think is called "Expo view" - it's in the second photo in @Ozo's screenshot, and drag from there. Much less convenient for me. Win 10 does have a workspace like feature - to be honest I ignored workspaces in Linux until after my work computers were upgraded to Win10 and I discovered how useful they were in my work environment to manage the multitude of windows needing to be open at all times to do the job. In Cinnamon you can right click on the windows list entry to bring down a drop down to move an app window to another workspace. Shift-Ctrl-Alt and the left or right arrow key will also move the currently focussed window to the next/previous workspace. There is scope to set keyboard shortcuts to move to a newly created workspace or a specific workspace and to move to specific workspaces. Finally - Ctrl-Alt and the up arrow will get you into Expo view without Hotcorners. There is also an Expo view applet. Swiping into the corner with Hot Corners is very effective. I have my panel on the left side and the swipe never interacts with the panel. I now do not want to turn my system off which would mean loading every thing back. I just did a test and found it takes about a minute to load half a dozen Workspaces. I put them all on one space then drag each to an individual Workspace. The VLC player can not be dragged but Media player can. Only one Workspace is really needed but I like to spread them out. Here is a photo of all seven on one Workspace. Notice the identifying icons on each item. Last edited by Ozo on Mon Mar 26, 2018 12:18 pm, edited 1 time in total. The Scale applet gives this view (photo) of all that is minimized to the panel. Scale is not nearly as good to view the active panel as Workspaces. Do not be disturbed by the W word as you do not have to do any actual work so do not worry. You know how cluttered the panel is with just 6 active icons. It is so much easier to focus on what you are looking for in the expanded view of Workspaces. For those with trouble focusing on more than one thing at a time it is an essential tool. Last edited by Ozo on Tue Mar 27, 2018 9:57 am, edited 5 times in total. Press ALT and then just tap TAB. That brings up all the active programs which in this case is the Workspaces. Then scroll through as fast as you want. I use a mouse but would imagine pads scroll this as well as touch screens. Trackballs now have a scroll function too. The dock too plays well with Workspaces as well as the panel. Each item in my Workspaces is also on the dock. On an empty desktop, open the dock and select one icon, Software Manager for example. It is not on the panel but is on a Workspace and will appear instantly. 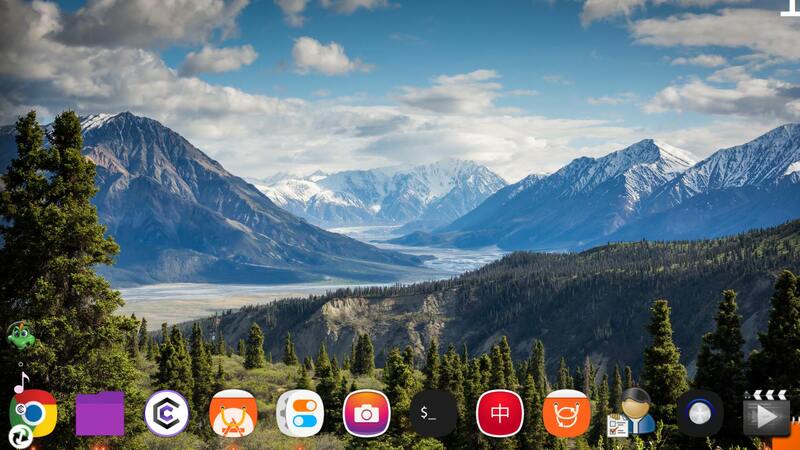 Click the dock icon again and the wallpaper is seen. The last icon selected will be the only one on the panel. Exceptions are Files and Settings which only bring up one instance so Desktop and Home can be on Workspaces but the dock only sees one of them. Same with Settings. There are six running Workspaces and yet the panel (on the left) is empty. Notice the music note icon on the panel indicates active media. Last edited by Ozo on Wed Apr 04, 2018 12:03 pm, edited 6 times in total. I'm with you, but I have one small advantage: I have 2 27" screens. I have one 40" screen. With Workspaces I have as many smaller screen as I wish. I keep four to six going and they are all visible across the room. With four the screens are equivalent to a 15" monitor. It is the new icon. First there were icons to aid navigation and then came thumbnails, then Workspaces. I can see now why folks are infatuated with multiple monitors. I, like most people, can only work on one space at a time. So, obviously some have missed the point. Workspaces does not divide your attention but allows you to focus on everything at once. It eliminates work. I give it my highest recommendation. After using the Workspaces for just a few days I have changed my mind about them. At first they were cool but now I see their true value. They are a great way to organize. Once the programs (is that the right term?) are installed in Workspaces virtually a single glance shows every direction you could take, or not. One day the Mint Wizards will find a way to resume after shutdown so the Workspaces will not have to be redone each day. It might be organization overkill but like I said "it is fun" to fuss with it. Tell me this is not organized. 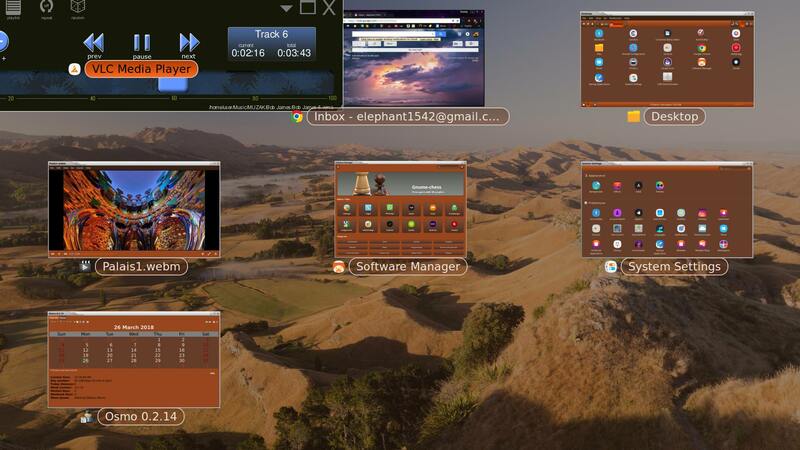 Every launcher is there with System settings and Software Manager is ready. The Desktop file has all the ones I might use (my favorites). We have a calendar, a browser (live), the Home files. Even the VLC player is playing music on a loop, and the Media Player is running as visualizations for the VLC player. There is even the game I play. Finally there is a clean desktop with Sylvia's slideshow running for when you are just listening to the music and want no distractions. Set up like this there is seldom any need to open the Menu or the panel for that matter. Even the dock is little used now except to launch all the stuff for Workspaces. It is kinda like getting an AI implant well maybe not quite. 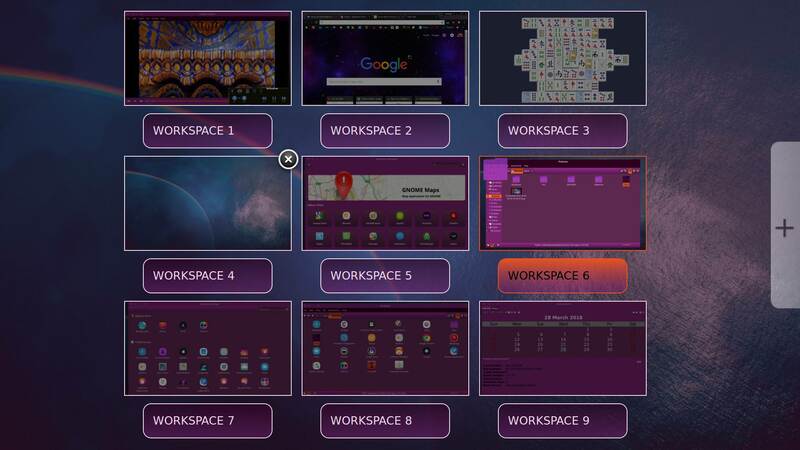 The first time you launch all of the programs from the dock onto a Workspace you will be amazed. Since all of the launcher icons are there for me it is nine quick clicks (don't wait). For me one of those clicks launches Cerebro. Talk about multi-tasking. Then it is simple to drag each one to a vacant spot, I do a little extra by putting the two players together and adjusting the size of each program to fully fit the window. That is all there is to it. Any 12 year old or precocious 8 year old could do this. EDIT: I have found that 4 to 6 Workspaces is easiest to maintain. More is ok but start with 4 in the morning and if you get busy and have more active workspaces no problem. Last edited by Ozo on Wed Apr 04, 2018 1:49 pm, edited 1 time in total. It is difficult to find fault with Workspaces but I just thought of one smallish fault with using the dock instead of the panel for interacting with them. When the dock is on the bottom it can be used like the panel would be. Pressing on a launcher opens that Workspace, press again and it goes back. The fault, if you will, is that there are no thumbnails when hovering over the dock launchers as there would be on the panel. There are indicators below active launchers, However; the only way to get a preview is to sweep into a hotcorner and view the expo view of Workspaces. Thats ok as those thumbnails need work. It takes too long to appear after hovering on them and they have no way to close without a right click. Since I open everything pertinent on the dock at startup I do not usually need any previews to remind me what is active. If you need a reminder just sweep into a Hotcorner for the expo view. I use the lower corners as they are close to the dock. There are small indicators below active launchers on the dock, more than one indicator shows multiple launchers on that workspace. 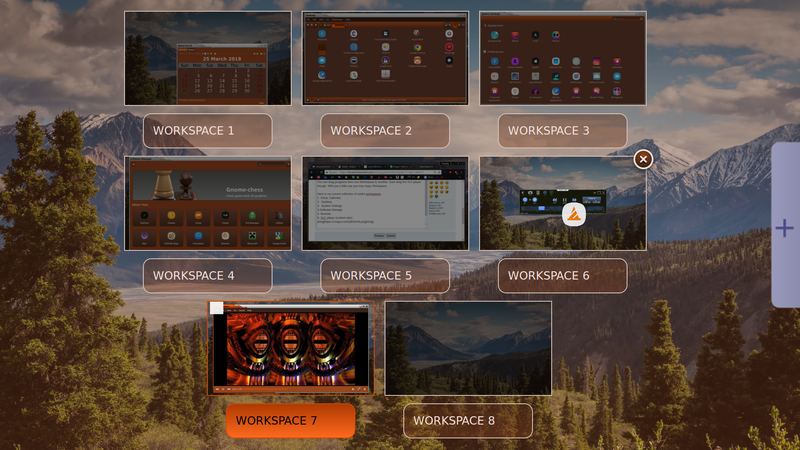 With Workspaces you think "minimize to Workspaces" not "minimize to Panel". There are no longer going to be any active icons on the panel. This is still evolving. The panel is now at the top. Since the panel calendar works so well in the horizontal panel there is no need for Osmo or the Dock clock. Also, since Workspaces has taken over for panel it seldom gets used so being on top is ok. Things are trimmed down nicely now and this system (Workspaces) is working better than I had hoped. Double Scale. Notice that the media player is active which can be seen on the panel (music note) and the dock Player launcher on the right. The player launcher is only on the dock when active. Found some more about Workspaces and the dock. I said "The active icon appears on the dock" . However; in preferences you can choose to not have them appear. I like that. Also, I stripped the panel so bare that the tiny Cerebro Search icon in the tray is no longer there but that still works fine as I have gotten used to turning it on each morning from the dock along with 3 launchers to pre-load Workspaces. The panel is better than ever. I installed transparent spacers so everything is not scrunched up. There are never any active launchers on the panel either since using Workspaces. 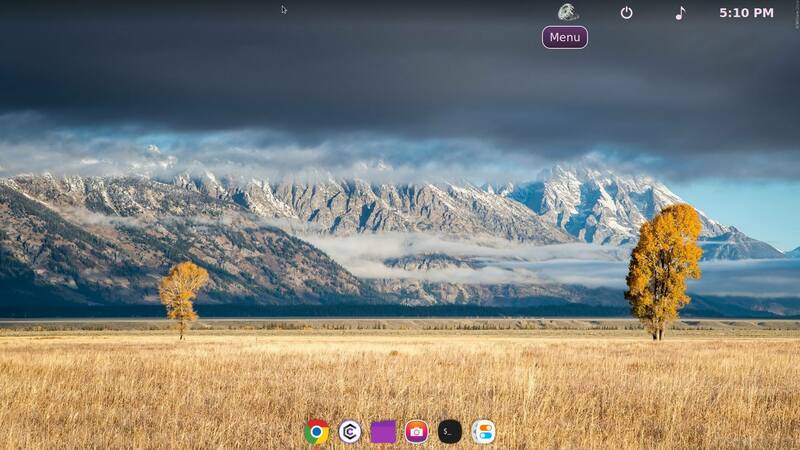 Here is the final product, no desklets, no docklets, no active programs, nothing but the dock auto hidden at the bottom. I shrunk the panel a bit and just leave it open so I can see the time. plus a click on that music note icon and I can control the music. A fault with the screenshot puts the pointer in the wrong place. It is of course hovering over the gear icon (Menu). I picked that icon because it matches the others. along with 3 launchers to pre-load Workspaces. 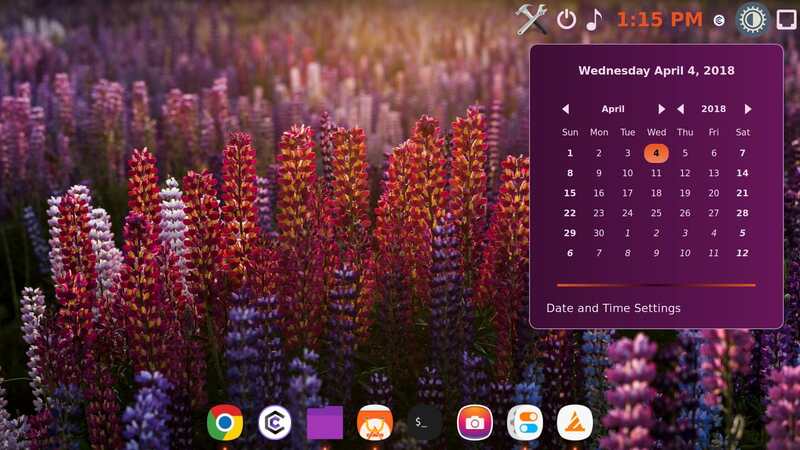 Looks very nice Ozo - I'm a fan of minimalism in general - although I've never gone as far as you on the desktop - my phone is wallpaper only on it's home screen with gestures to open app drawers etc. 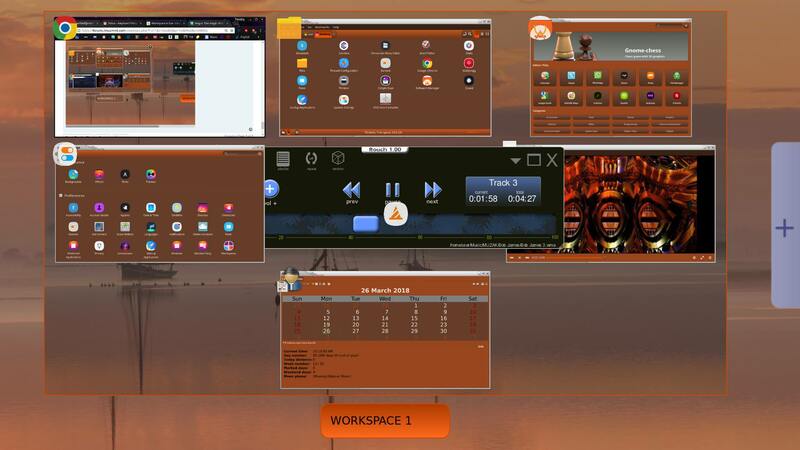 A question - have you managed to automate selection of workspace in some way with your 3 launchers or do you need to select the workspace first and then the launcher opens the programs you have set for that workspace? It looks like automation is possible using a CLI app wmctrl - see https://superuser.com/questions/232042/ ... -workspace. So in theory you could have a start up script that launches a set of applications on login and moves them to the preferred workspace without any user interaction. -l                   List windows managed by the window manager. -s <DESK>            Switch to the specified desktop. -c <WIN>             Close the window gracefully. -r <WIN> -t <DESK>   Move the window to the specified desktop. -r <WIN> -e <MVARG>  Resize and move the window around the desktop. The format of the <MVARG> argument is described below. argument and list of possible states is given below. -r <WIN> -N <STR>    Set the name (long title) of the window. -r <WIN> -I <STR>    Set the icon name (short title) of the window. -r <WIN> -T <STR>    Set both the name and the icon name of the window. do not implement this mode. -o <X>,<Y>           Change the viewport for the current desktop. The X and Y values are separated with a comma. They define the top left corner of the viewport. The window manager may ignore the request. 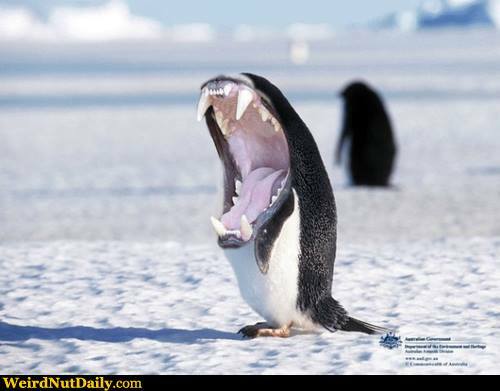 -n <NUM>             Change number of desktops. -g <W>,<H>           Change geometry (common size) of all desktops. -i                   Interpret <WIN> as a numerical window ID. X applications support this feature. -G                   Include geometry in the window list. interpret <WIN> as the WM_CLASS name. -u                   Override auto-detection and force UTF-8 mode. instead of a substring, when this option is used. Furthermore it makes the matching case sensitive. -v                   Be verbose. Useful for debugging. times. List of available workarounds is given below. it will be interpreted as a hexadecimal number. the -F option in conjunction with the -x option. window by clicking on it. active window for the action. <DESK>               A desktop number. Desktops are counted from zero. default gravity of the window". <X>,<Y>: Coordinates of new position of the window. <W>,<H>: New width and height of the window. to left the property unchanged. by the means of _NET_WM_STATE request. A very simple implementation works - script opens gnome terminal and moves it to workspace 1. me@mypc ~ being whatever your terminal window title is when first launched. Just expand the script replicating this code snippet for the additional applications you wanted opened and moved to a specific workspace. It is automatic. I just open all the launchers at once and they are automatically on workspace one. Then I drag them to individual workspaces. Takes only a few seconds. You can just let the spaces fill up as you go but I like my method. In Workspaces you can set the view and when hot corners are selected you are all set. I use a dock which simplifies installation of the launchers on workspaces but there is no requirement for the dock. 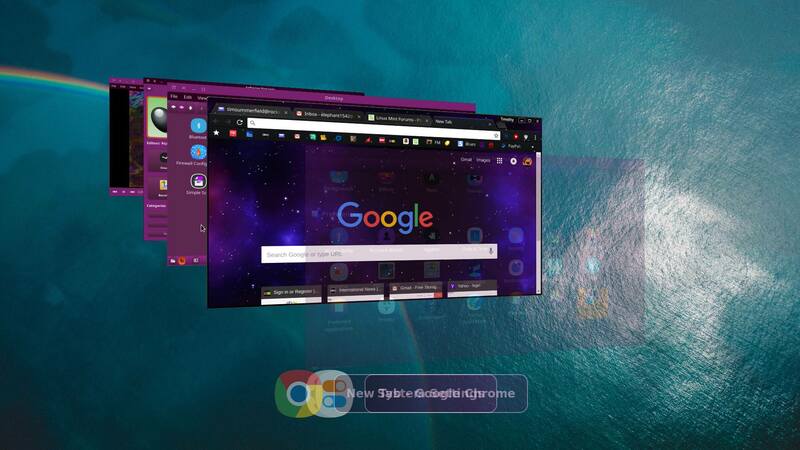 I install the launchers on the dock with the aid of the desktop. When an item is right clicked in the menu there is an option to install it on the desktop. 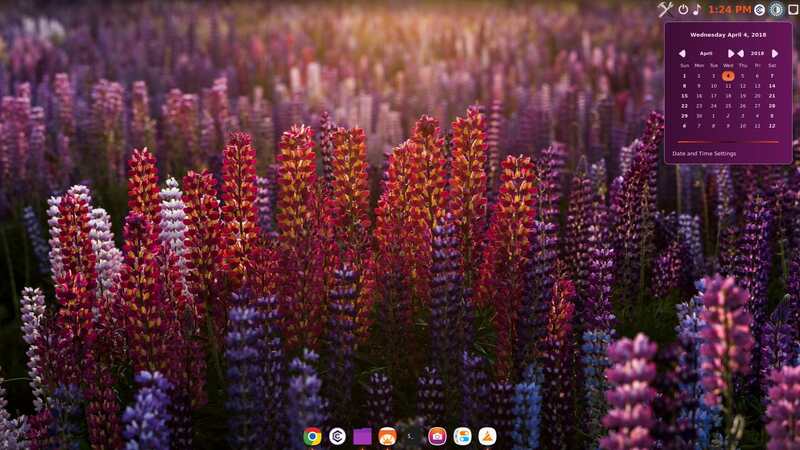 Launchers can be dragged from the desktop to the dock. I keep all the important launchers on the desktop but hidden. I can install the dock fresh in seconds this way. There is one more thing I did not mention. There is an applet called Workspace Switcher which puts options on the panel to open whichever workspace you want (no thumbnail). I do not like it because it clutters the panel. It is automatic. I just open all the launchers at once and they are automatically on workspace one. Then I drag them to individual workspaces. Takes only a few seconds. You can use the script snippet in my post to skip the dragging step. Click and watch your workspaces fill up. That sounds great but I am unsure how to implement it. Did you actually duplicate that automatic mode? This is unclear, "Just expand the script replicating this code snippet for the additional applications " or rather over my head.